Starring Ronald Howard, Henry Daniell, Torin Thatcher. Written by Donald S. Sanford, based on the story by John Clemons. 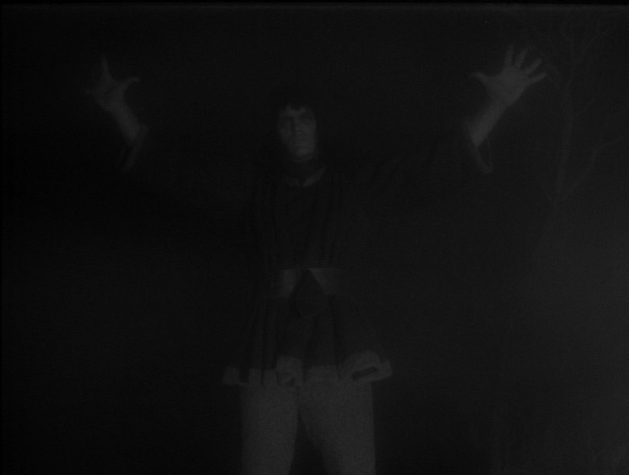 Robert Penrose (Howard) and his butler Jeremy Teal (Thatcher) are kidnapped by the ghoulish Moloch (Daniell) and giant Styx (Richard Kiel). Teal is murdered and Penrose is taken to an underground dungeon, where he finds his fiance, Laura (Fintan Meyler), gagged and bound behind bars. Penrose must find a way to get out of the dungeon before Moloch can hatch his evil plan. JS: Wow! Talk about a pleasant surprise. There's something to be said about going into an episode with no expectations. While not perfect, this is a great show from start to finish. PE: Why is it that when the best Thriller episodes are debated, I've never heard "Well of Doom" discussed? Looking very much like Lon Chaney in London After Midnight, Henry Daniell is suitably creepy, the lines and valleys on his face (is it me or does his face seem to be melting?) more hideous than some of the monster make-ups in these shows. The peril facing Penrose and Laura seems real at all times until—SPOILER ALERT—well, crap, it not only borrows Chaney's look from London After Midnight, it also cops its climax. JS: That aspect didn't bother me too much. It was just cool to see a man in a beaver hat chewing up the scenery like one could only imagine Chaney doing. One more thing about the ending - I have to take back what I said previously about Quentin Tarantino lifting the ending to Reservoir Dogs from the climax of "Man in the Middle." Clearly he got it from "Well of Doom." PE: Never before have I seen such a perfect dramatization of a "shudder pulp." Being that the story came from one of the oft-derided mystery/horror pulps of the 1930s (the May 1936 issue of Thrilling Mystery to be exact), it's not too much of a stretch. The show literally smells of pulp paper and typewriters hot to the touch. It's also probably the only time you'll ever get to see Richard Kiel in a tutu. JS: That reveal of Kiel was pretty darn effective - seeing him towering in the fog. What amazed me in this episode was that despite it being clear that they were walking through a fog enshrouded soundstage, it doesn't take away from the atmosphere that is built up. I was even willing to forgive Torin Thatcher's pratfall in the moors. PE: Composer Jerry Goldsmith adds yet another feather to his cap. His score amps up the tension twenty-fold. JS: I'm beginning to feel bad for Pete Rugolo, who had good and bad days working on Thriller, because frankly listening to one Goldsmith track after another, he sure makes the job seem effortless. Then again, look at Goldsmith's body of work. If he's written a bad score, somebody please point it out, just so I can say I know what bad Jerry Goldsmith sounds like. In this episode in particular, you get cool, elaborate scenes sans dialog, with only the score to carry them, and they work perfectly. PE: For those interested in reading the original story (and not wanting to fork over lots of dough for a moldy old rag that could become dust at any moment), the issue of Thrilling Mystery that contained "The Well of Doom " was recently reprinted by John Gunnison's Adventure House . You can order it here . JS: I was left with one lingering question when all was said and done. Do you think Penrose's buddies still had the bachelor party without him? PE: Gary Gerani and David J. Schow deliver, in my opinion, the most entertaining and informative commentary yet. For this blog, I watch the episode first then watch it again with commentary. I'd like to thanks Messrs. Gerani and Schow for making my job on this particular show that much harder. Most of my notes ended up in the bin since most of my observations were voiced during the boys' party in front of the tube. I swear I had "This is just like London After Midnight" and "this reeks of shudder pulps" before I listened. No, really. JS: Two words I would use to describe this commentary - unbridled enthusiasm. My favorite commentaries have always been those where it's clear the participants are having a good time (John Carpenter & Kurt Russell, anyone? ), and that's definitely the case here. I personally can't wait to read David J. Schow's Adventures of Moloch and Styx. What a welcome SHOCK! From here on, William Frye was grooved in and would regularly turn out masterful, moody and compelling smallscreen horror. Except that "Well of Doom" is a horror episode that's really a CRIME episode...but that's not important. 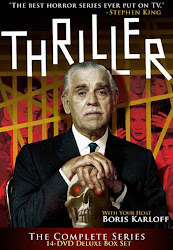 Of "Thriller's many accomplishments, I continue to salute the series for offering major opportunities for some of cinema's greatest character actors to shine. I have four particular guys/roles in mind, and the first---and perhaps best--of them, is featured here. Henry Daniell's Grand Guignol portrayal of Mollock---hissing, cackling, sneering, sadistic, imperious, malevolent---is a tour-de-force beyond anything than one would ever have imagined coming from a weekly TV series, no matter how "thrilling" it claimed to be. It's WAY off the chart! ; the man was simply an incredible perfomer. And how fascinating to see him "au naturel" in the final scenes, so hellishly believeable had he been throughout the show. (who had just finished menacing Kerwin Matthews in "Jack the Giant Killer", filmed in July of 1960), add another fine Brit in Ronald Howard...and you've got yourself one heck of a dramatic ensemble. A fine script, amazingly atmospheric camerawork, excellent direction (it seems clear that the three major actors and John Brahm got along very well on this one) and incredibly spooky settings all contribute to the power of this episode. We all know that the tension-filled walk from the car through the moors to the castle was filmed on a soundstage, but Penrose and Teal seem to be literally on their way down to Hell, as they desparately try to escape. Really chilling, terrifying stuff. So effective is this show that one easily overlooks the obvious mummy/dummy that's used for Penrose being tossed down the well at the close of Act 3, and Richard Kiel's good-old college try at line readings in the final scene. serpentine theme played by low trumpets in unison, a bold and almost nauseating sound that ramps up the thrills and chills of this first-rate episode. Yep, WELL OF DOOM is certainly on of THRILLER'S finest hours (one of the series' ten best if you will) Daniell is brilliantly menacing, the episode is brooding and ghoulish, and the narrative is imaginative and comparitively challenging. One of the series' most nightmarish episodes. Sam Juliano hit upon the perfect adjective for "Well of Doom," I think: It's nightmarish. Meaning: Almost like a fever-dream in its thorough intensity. A waking nightmare. Not to belabor the commentary, but I was as surprised as anyone to discover the LONDON AFTER MIDNIGHT elements were ported from the short story, not "invented through convenience" by the production. Thank Stefan Dziemianowicz, again, for this insight. Although it's fair game (imagine the meeting, again): "Well, nobody will ever be able to see LONDON, so why don't WE do it?" THIS is a THRILLER! Naysayers take note. Just to keep everyone on their toes, please check the Comments section on "The Cheaters" for my post about Jo Gabriel. Re: "The Adventures of Moloch & Styx:"
This was actually proposed as a spinoff series, and several scripts were written, but I don't think it ever got to greenlight. absolutely hilarious. my favorite thriller episode, although it would have been better had styx lunged at howard, missed and gone hurtling down the steps to his death. I used to have an extensive collection of weird menace pulps such as HORROR, TERROR, DIME MYSTERY, and THRILLING MYSTERY. Eventually I got tired of the stories and could no longer read them but they can be fun if you read them as outrageous black comedies. Most of the plots had insane supernatural events taking place but everything would be explained away with natural and logical endings. Sort of like a plague of zombies might invade a town and kill dozens but at the end it would all be because some clown wanted to take over someone's estate or property. The stories are hilarious if taken in small doses, otherwise they will cause you serious mental problems. Something tells me I'm going to have nightmares about David's series in general, and "Vaudeville Beckons" in particular. This is not only a very entertaining episode, but once again it comes on the heels of a row of stinkers! It must have been tough to stick with "Thriller" during its first run. I know I am a month late on all of my comments, but I want to say that Larry Rapchak's remarks are always most enjoyable and a nice addition to the blog. >>I want to say that Larry Rapchak's remarks are always most enjoyable and a nice addition to the blog. Amen! There were several times during this looooong run of shows when I thought of retiring and turning my end over to Larry R. Then something like Well of Doom would pop up and I'd become reinvigorated. The joy of doing this blog though is not the Thriller episodes but the comments left by DJS, Larry R. Larry B., Gary G. and all the other regulars out there, including you, Jack! It was a bit of a second rate Hammer film and the ending sucked. If it wasn't for the totally creepy, awesome performance by Henry Daniell, I probably would have fallen asleep. Fun seeing Kiel actually get to really act for once. I wonder if I was watching the same episode as most of the rest of you! I found this slow-moving, with a clunky plot and clichéd characters. The ending was fairly obvious, as the action up to then was so melodramatic that it had to be a charade put on to deceive the unsympathetic "hero". Henry Daniell gave a watchable performance, but not enough to sustain fifty minutes. Torin Thatcher, who usually makes a great villain, was handicapped by a very dubious Scots accent. Even Jerry Goldsmith's score seemed heavy-handed and monotonous. To me, WELL was rather reminiscent of HAY-FORK AND BILL-HOOK, but not as much fun. One out of four Karloffs. 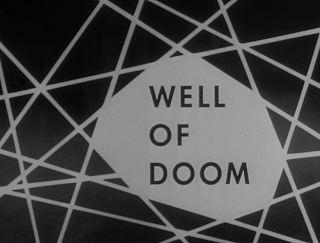 WELL OF DOOM has all the elements we look for in a THRILLER. Great sets, great music, great story. Good from beginning to end, although Richard Kiel's attempt at acting in the final sequence brought me quickly back to reality. Thank God they took advantage of Henry Daniell's unique acting abilities. I think he's fantastic. Loved this episode. Loved it, loved it. Very creepy. To me, this is what Thriller should have been all along. I was two and three years old when Thriller first ran, and I can remember my older brothers and sisters talking about it. So glad it's out on DVD, finally. Thanks for this website. I don't know fellas, I think you love this one a bit too much. I thought the scene when he was alone escaping from the cell and asking his love to pound on the door really dragged. I picked up a newspaper and started to read. Anything but gripping, although "London After Midnight man" was quite effective. I really thought the ending sucked. What a roundabout way to go about getting what you want out of the guy and, as many have said, its a total supernatural cop out. The first scene was creepy, but it kind of fizzled out from there. Two-and-a-half Karloffs for me. Despite the London After Midnight, or for most of us Mark of the Vampire, ending, Well of Doom was an outstanding Thriller episode. The rest of the cast filled out their rolls with respective performances. Well, except Styx (sans Dennis DeYoung), who just needed to look the part. I kept waiting for Roger Moore to appear and rescue Howard. Add my voice to the choir about the obvious sound stage setting not detracting from the atmosphere, which was still convincing and effective. The musical score written with eire harmonic sympathy to the various scenes. Everything clicked! I loved the contrast in suspense that was created by the wide open fog encased moors and the grim dungeon style basement. The moor evoked frights of unknown and unlimited darkness. In the basement, all the architecture was known, fixed and brought on a suffocating clausterphobia. I agree with the complaints that the pace was glacial at times, but for me this enhanced the slow dreamlike doom of the episode, which implied slow death for our victims. Okay the Jerry Goldsmith music made a difference. Pete Rugolo should go down in history as creating the most annoying, screeching, train wreck, clanking passed off as a TV theme. Sometimes his "music" alone ruins it for me. Pete, if you're still alive - shoot yourself. Okay this episode was a notch above, but was anyone else annoyed by the obvious blackened tooth? This one really came in out of left field. The off-the-wall "supernatural" story was far different from anything the series had done until then, but I actually believed it (guess I'm as gullible as Ronald Howard's character). The crazier it got, the more it made me think of Oliver Stone's "Seizure." Loved Henry Daniell and the blacked out tooth. I even loved the reveal, because he was so funny as the old trooper. 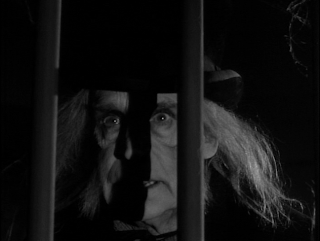 It reminded me of Bela Lugosi at the end of "Mark of the Vampire," the remake of "London After Midnight." It was fun to hear Richard Kiel's normal voice, and I felt sorry for him having to believe Howard was a ghost, particularly since the script didn't have him do a hell of a lot to convince him of the fact. But the fall was great, so it sort of evened itself out in the end. This is my first trip through the Thriller canon and thoroughly enjoy checking this blog after each episode. What I`ve found most interesting is how often I seem to be completely bass-ackward to the majority of the critiques, especially those of our Hosts. I mean THREE stars for Guilty Men???? This was a fun show, yes...how could it not be with Travers absolutely chewing up the scenery? Reminiscent of old Universal horrors and just as silly...anyone else bugged that when our hero is thrown down the Well of Doom they leave him a rope? I give it a two Karloffs for being so damned camp. I found this episode to be something of a letdown. Good acting performances from Ron "Sherlock Holmes" Howard, Torin Thatcher, and even Richard Kiel. But the twist at the end is that there is no twist. The ghouls holding Howard hostage are just hucksters out for his money (which we'd figured out about a half hour ago). There's no big surprise or revelation at the end, Howard simply escapes and defeats them. Even his girlfriend, who I was sure was no longer in the cell (since we only heard taps, but never saw her). Surprise, surprise, she was there. So everything went exactly as he'd planned 15 minutes before the show ended. I guess the twist was supposed to be that Torin Thatcher was really alive, but I'd sort of figured that out already, since he'd dropped dead simply from having a finger pointed at him. If the ghouls are really con artists (which was obvious from their preoccupation with Howard's money), then Torin must have been in with them to have died that way. One of the things I found most disturbing was that Howard told us his plan in advance (I'm going to sign, then pretend to fall to my death in that well). Normally, the rule is that if the audience knows the plan in advance, it won't work, but if they DON'T know it until after it's over, it will work. This time we knew his plan, and it still worked. I guess that's a surprise of sorts. But also a letdown. I agree with the comment, "The musical score written with eire harmonic sympathy to the various scenes"-Jerry Goldsmith can't be beat at this genre, PE and LR reviews corroborate this while Saltwell takes exception. Also, Daniell visage, why shades of Alistair Sims in "Scrooge"? Is there an existing print of London After Midnight? I have only seen stills and Henry Daniell is a doppelganger for Lon Chaney. And isn't this Richard Kiel's best performance ever? This episode is a masterpiece. One problem with the You-Tube Goldsmith/Thriller Suite, admirable though it may be: three of its musical excerpts are from episodes scored by Morton Stevens. Love the hilarious commentary on this blog. I stumbled on to this show a few months ago on ME TV, on at 4 am here EST, so I tape them each night and watch the next day. The opening scenes were masterfully directed; and the first appearance of Moloch and Styx emerging from the darkness downright shocking, nightmarish, could serve as a primer on how to evoke horror on a small budget with really good ideas. So far, so good. Henry Daniell saves the show for me. Otherwise, it was somewhat of a disappointment. With those killer first (roughly) ten minutes I was hoping for so much. Considered purely as a horror, Well Of Doom sort of shot its bolt early. For most of the rest of the show it was second rate melodtama, though the atmosphere remained compelling. Something was obvioudly "up", but for the first time viewer, or for this one anyway, I didn't get it. Or maybe I'm just obtuse. The ending was clever, I admit, but the effect was for me ho-hum, as the set up was so good I was expecting and hoping for something more along the lines of Pigeons, The Grim Reaper, Markesan, The Cheaters, The Hollow Watcher or Parastite Mansion. In the end the episode felt more like a Halloween prank, a Treat or Treat. 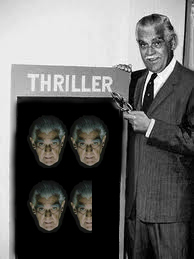 Hitchcock did a few like that, complete with dancing elves music, but Thriller was more of a straight horror show, and Karloff's intros were mostly spooky, not fey like Hitchcock's. Not an awful episode. Well Of Doom, but a letdown.